The Large Clearside Enclosure has clear panels on the front, right side and back. The left side and top are screen to give you a bend of humidity retention and ventilation. The left screen side also gives you a convenient side to release feeder insects so they may run up it and stimulate the hunting response in your pet. 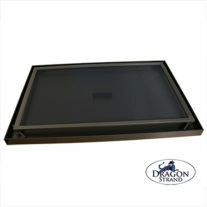 The Large Clearside Enclosure comes with five Dragon Ledges and an extra floor panel to allow easier deep cleaning. The clear material is a durable, flexible PVC making it almost was light as screen, but stronger. Please note: This material is NOT acrylic! The Technology. The clear side line uses a thick, clear PVC sheet. This PVC technology produces a flexible, but durable sheet that is as clear as glass or acrylic, almost as light as screen and more scratch resistant than acrylic. It is pulled taut, but still retains some flexibility which is advantageous when keeping animals such as Uroplatus and Rhacodactylus which aggressively launch themselves at feeders. The clear PVC absorbs the shock and decreases the chance of snout damage. Note: Working with the clear side material is a more involved process and so we are building to a schedule. If you desire the benefits of a Clearside cage please email us at dragonstrand@gmail.com and we will give you time of our next build. You are welcome to place an order and reserve your space in the build or else you are able to check back on the progress closer to the build date. We anticipate having a group available every two months. 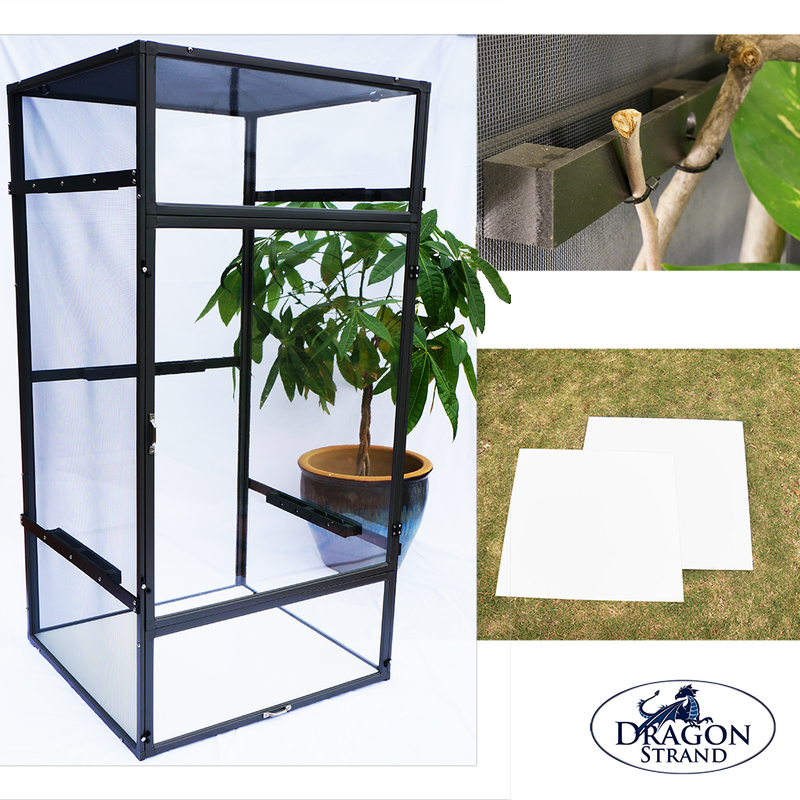 At Dragon Strand we build the Clearside enclosures on a cyclic basis. The next build of the Large Clearside Enclosure will be in the month of June, 2019. Advanced ordering is never required, but priority is given to placed orders. The Large Clearside Enclosure provides and ideal platform to create a show piece enclosure. The solid clear sides allow unrestricted use of automatic mist heads without worry of drenching house walls and furniture. The right side of the cage is surrounded by solid sides so humidity is retained. The left side and top of the cage is screen allowing for ventilation. A high to low humidity gradient may now be created right to left. The left side was chosen to be the screen side to facilitate controlled release of feeders. If you desire to release feeders in your cage to stimulate a hunting behavior it is a simple thing to crack the door open just enough to allow your hand or feeder cup in to place the feeder on the screen to let them run up. Care of the Clear PVC. The clear PVC material may be cared for much like acrylic. Use RO or distilled water as mineral spots will block your clear view inside the cage. When cleaning the clear panel use RO or distilled water and a soft cloth towel. Do not use wood based products such as paper towels. Although the clear PVC is not as prone to scratch as acrylic, it is still not as resistant as glass. Large Drip Easy Drainage System. The ideal drainage solution for the Large Clearside Enclosure is the Large Drip Easy Drainage System. This system contains a screen panel floor to replace the standard white PVC floor included with the enclosure as well as a drainage tray. The screen floor allows mist water to flow directly through the floor and into the drainage tray. The screen floor also partners with the black drainage tray to mask that there is a floor giving your naturalistic set-ups a more attractive look. Large Keeper Drainage Tray. The Large Keeper Drainage Tray sits under the cage and collect excess water keeping it out of the enclosure and away from feces and escaped feeders. It is recommended that small 1/16” holes be drilled at regular intervals in the PVC enclosure floor (NOT in the drainage tray) to facilitate quick drainage into the drainage tray. The Large Keeper Drainage Tray has corner support for the enclosure and a middle support for the enclosure floor to handle light weight plant pot support. 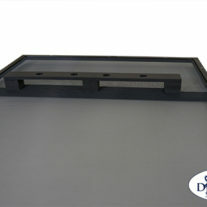 For a more robust enclosure floor support system consider the 25” Heavy Duty Drainage Tray. 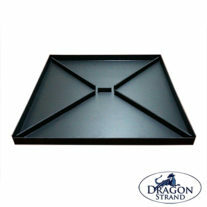 25” Heavy Duty Drainage Tray. 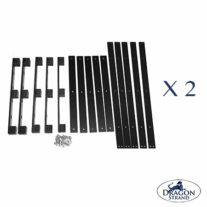 This Drainage Tray provides greater support for the enclosure floor through an “X” pattern of thick PVC plastic spacers. This allows more freedom in enclosure plants and decorations. Large Keeper Substrate Tray. Substrate trays go inside the cage and provide a basin for a substrate that your interior design requires. Usually this is a layer of hydro balls covered with a fabric and soil on top. This substrate tray is water tight. 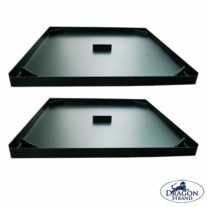 If drainage is desired it have be used with the Large Keeper Drainage tray or the 25” Heavy Duty Drainage Tray. When a drainage tray is used, drill small holes at regular intervals in the bottom of the substrate tray and your substrate will naturally drain allowing you to mist your enclosure without worry of saturating or flooding your substrate. With just the substrate tray you would use the standard PVC floor panel that came with the enclosure. When using the substrate tray with a drainage tray, the standard PVC floor panel is not required. 23” Dragon Ledges. 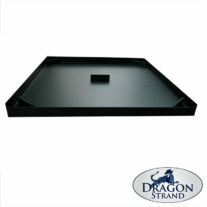 Five 23” Dragon Ledges are include with your Large Clearside Enclosure so these are unnecessary to purchase separately. But should you require more ledges, for any reason, the 23” size is the one to purchase.